With drama being such an integral part of a child’s development, we look for opportunities to get creative. There are three chief avenues for dramatic expression at Kirstenhof. Drama is seen as a part of the curriculum and opportunities are given in the classroom to do skits and learn through acting out dialogues (in different languages). Very often classes are given the opportunity to run assemblies in the older Grades, giving them a chance to display their skills. Drama is also offered as a private extra-mural where children participate in their age groups. Spotlight Drama school, run by Debbie Geldenhuys, is responsible for these classes and a highlight of the year is always a Drama Evening as each Grade represents their production. There are also a number of productions that the school puts together annually. 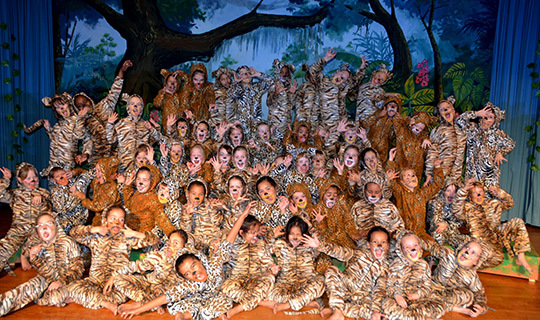 Every child has the opportunity to be part of a school production while in the Foundation Phase. For those who don’t like being in front of an audience, there is also the opportunity to help back-stage and (for the older children) learn how to do sound.